An official inquiry in Rwanda has called for criminal and civil proceedings against the BBC over a documentary which questioned official accounts of the 1994 genocide. Inquiry head Martin Ngoga said the documentary had failed to meet the BBC's own editorial standards. The BBC says it is "extremely disappointed" by the findings. Rwanda suspended broadcasts by the BBC's Kinyarwanda language service after the TV documentary was aired. "We stand by our right to produce the independent journalism which has made us the world's most trusted news source," the BBC said in a statement. It said the programme was still going through its editorial complaints process. "This process has not yet concluded but the provisional findings are that the documentary does not breach the BBC's editorial standards," the BBC said. At least 800,000 people died in the genocide over a 100-day period in 1994. Those killed are generally believed to be mostly members of the minority ethnic Tutsi group, and Hutus opposed to the mass slaughter. The BBC programme Rwanda, The Untold Story, included interviews with US-based researchers who say most of those killed may have been Hutus, killed by members of the then-rebel Rwandan Patriotic Front (RPF), which has been in power since 1994. The programme, broadcast in the UK in October 2014, also included interviews with former aides of RPF leader President Paul Kagame, accusing him of plotting to shoot down the presidential plane - the act seen as triggering the slaughter. He has strenuously denied previous such accusations. 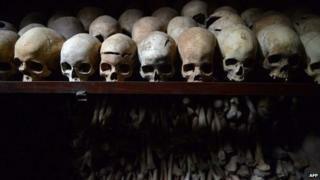 Critics in Rwanda say that the documentary was an attempt to revise the history and facts of the genocide, and disrespected the memory of those who had died. The BBC "strongly rejects any suggestion that any part of this documentary constitutes genocide denial". A parliamentary resolution in October said the programme's producer and presenter, as well as those interviewed for the documentary, should be charged with genocide denial - a punishable crime in Rwanda. The BBC argued around the same time that it had a duty to investigate difficult and challenging subjects and believed the programme was a valuable contribution to the understanding of the tragic history of the country and the region. The BBC also said several attempts to get the Rwandan government to respond to the allegations for the programme had not been taken up.